Over the past couple of months, our staff have been busy finishing off projects so we thought we'd share them with you here. 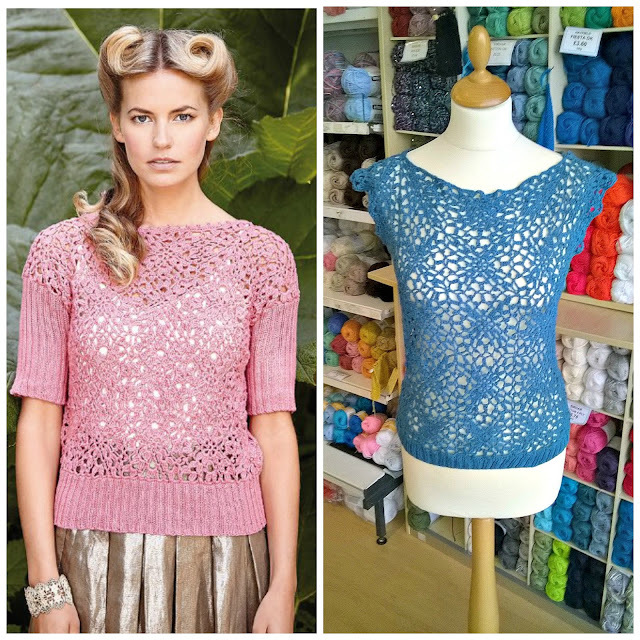 Emma in our Stirling shop made this gorgeous crochet top in Sirdar Cotton 4 Ply shade 524. "After looking for a nice lacy crochet top for summer I found this in the latest Rowan Magazine. After doing the main design of the front and back I made a few tweaks; shortening the rib, getting rid of the sleeves and changing the neck edging. Just what I was looking for. Don't be afraid of changing a pattern! PS. It only took two and a half balls of the Sirdar Cotton 4 Ply!" This was such a quick project and I really enjoyed making it. It's designed to be knitted in one piece, from the bottom up. I knitted the body first but then I was so excited to get started on the colourwork that I decided to postpone the sleeves and knit the yoke first. I worked a provisional cast-on at the top of the sleeves, knitted the yoke, then picked up the sleeve stitches and knitted them top down. The Creative Focus is incredibly warm and I love having sweater that matches my hair! "As the weather was so horrible for my day off, I finished a couple of garments. The child's duffle cardigan was knit in Hayfield Chunky Tweed, shade 182, from Hayfield pattern 4486. It is for my German friends' new baby; they are coming to Scotland for my wedding and I thought the child might need a warm jacket! The other one is an edge to edge cardigan. Having knit it last September, I just finished sewing it up. 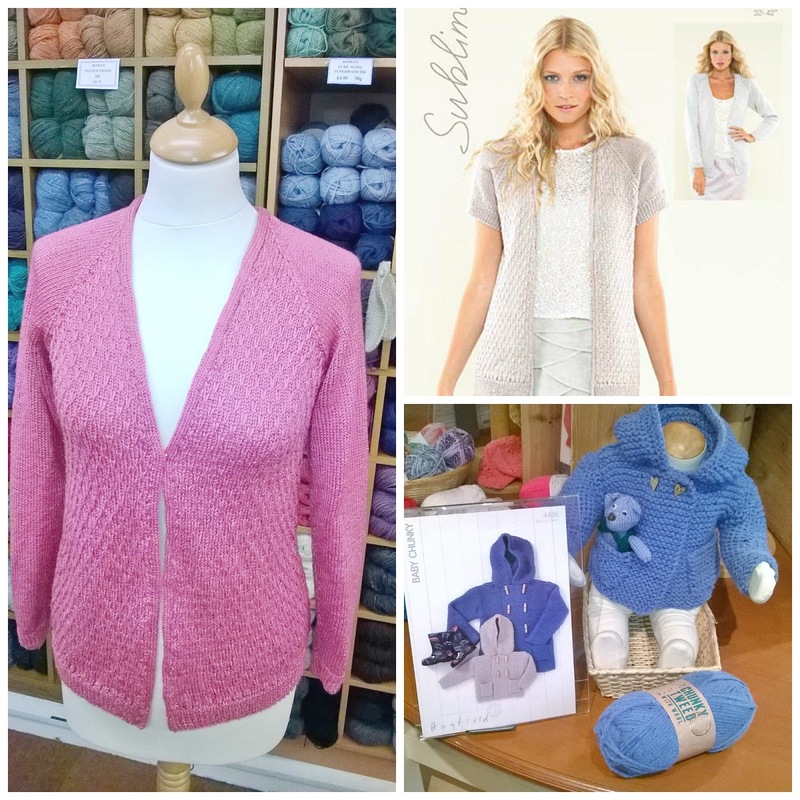 It is knit using Rowan Pure Silk, shade 159 Rose, which we have on offer on the website. The pattern is Sublime pattern 6085, which is also in booklet 667. The stitch in the main body was simple but effective. Now my dilemma is what to do next. For the first time in a while I have nothing on the needles!" 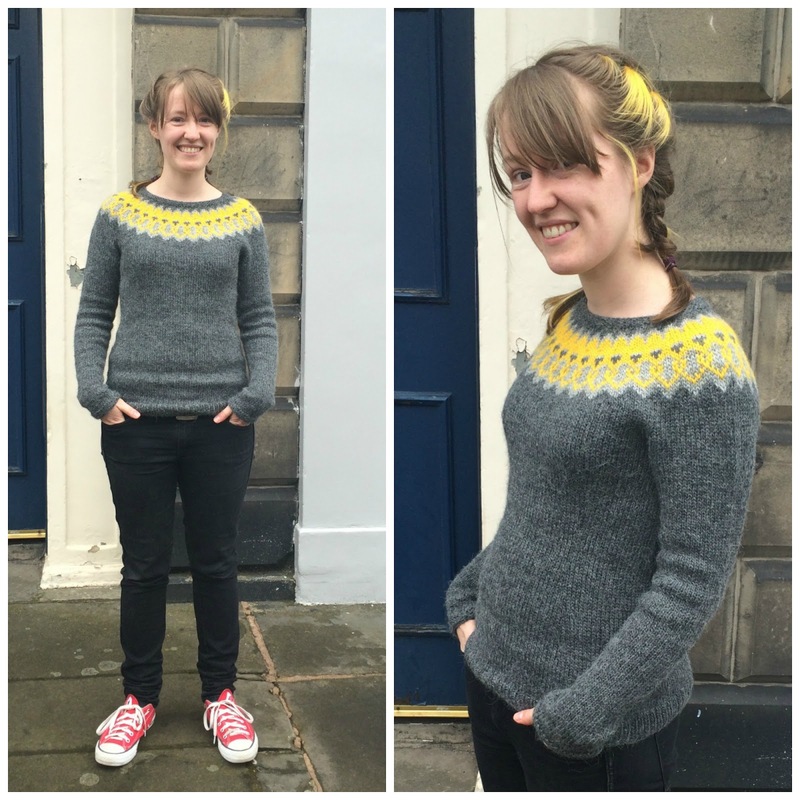 And finally, we were so happy to see that Leah from the Edinburgh shop has finally finished her Nordic mittens! These mittens were knitted in Rowan Pure Wool 4 Ply, shades 412 and 455, and Leah adapted the pattern to include her friend's initials and wedding date. The blue and cream shades look beautiful together and the strong contrast between the shades allows all the details in the colourwork to be visible.